talking about beda (the bureau of european design associations), it's website hosts a pdf document entitled "how could design shape europe's future?" which is worth being consulted. the research project was conducted between 2002-2003 in partnership with the design council, the university of art & design helsinki (taik), the interaction design institute at ivrea in italy (idii), the conservatoire national des arts et metiers (cnam) and the agence pour la promotion de la création industrielle (apci) in paris. torino, world design capital in 2008 – under the icsid-led "world design capital" program – will receive on november 6 and 7 an international public design policies conference, "shaping the global design agenda". 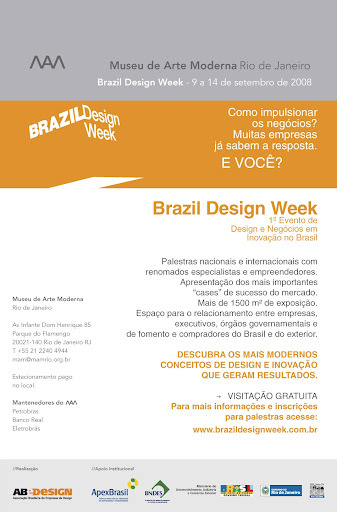 the conference is being organized by michael thomson, current president of beda, the bureau of european design associations, and one of the guests for the brazil design week. 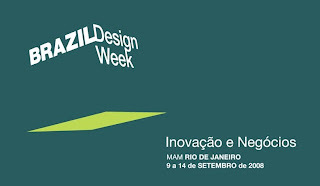 from 9 to 14 of september, at the modern art museum of rio de janeiro, there will be the brazil design week, a brazilian design trade and promotion fair. the program is outstanding. 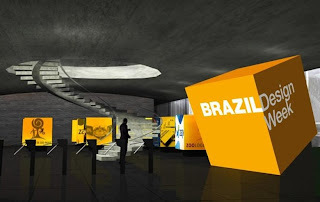 the paper "brazil: the natural knowledge economy", comissioned by cgee - center for managing and strategic studies, was released this month in london. the study was developed by kirsten bound, researcher from demos ("the thinktank for everyday democracy"), and it shows a situation extremely conducive to innovative thinking in brazil, with increasing number of research projects and resources allocated for innovation programs. the paper can be downloaded, in pdf format, from the website of demos (at the above link). 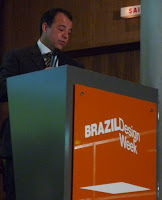 and if you want to know how much it is already reverberating, check the post of the online design magazine core77 here.